While researching about Cebu, I came across countless raves about Cebu’s Pochero, particularly from the restaurant called Abuhan. Ever the fan of scrumptious food, I listed down Abuhan’s address in my little notebook. After the heat of walking around the city and feeling the fatigue settling in (I had the grand idea of working and NOT getting any sleep before my 5am flight), I decided to have an early lunch at Abuhan’s. It was pretty pricey for one person, I thought as I look at the menu. At Php 260 per bowl, it better be worth it. And it was. The bowl was HUGE. One serving was enough for 2 – 4 persons, so the price of one bowl can go as low as Php 65 per person. I was pretty dehydrated by this time, and a big soup fan, I happily sipped the broth. It devine; the beef was very tender, the veggies crisp and the soup was very tasty. Abuhan’s pochero is unlike the pochero we know in Manila. 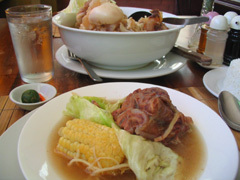 While our pochero is red with tomato sauce/paste, their is more like a bulalo. It is served with a small knife for cutting off beef still attached to the bone and a popsicle stick for digging out the marrow. Mmmmmmmmm. I read somewhere that there are two Abuhan branches in Cebu, Abuhan 1 and Abuhan Dos. I went to Abuhan Dos, which is at F. Ramos, near the Fuente-Osmeña Circle. It’s also less than five minutes away from Robinson’s by foot. there’s another good place to eat pochero in lahug. i don’t remember the name, but it’s quite popular in cebu. i haven’t tried the pochero at abuhan, though, so i can’t make a comparison.